The Ministry of Health of Czech Republic held a press conference and policy dialogue on prevention of child maltreatment on 24 October 2013 in Prague. 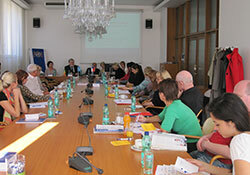 The events were organized in close collaboration with WHO Regional office for Europe. The meeting was opened by the Minister of Health, Dr Martin Holcat who welcomed participants and emphasized the priority given to child maltreatment prevention in the Czech Republic. Dr Alena Steflova, Head of WHO Country Office in Czech Republic, underlined the importance of child injury and violence prevention in the collaboration between WHO and the Ministry of Health. The high prevalence of child maltreatment as reported in the European report on preventing child maltreatment set the scene for the Czech national study. The survey on adverse childhood experiences y among young people in the Czech Republic was presented by Professor Milos Veleminsky of the University of South Bohemia. Prevalence rates were reported as high and there were also increased prevalence of health harming behaviours. The results of the national survey were discussed with multisectoral stakeholders for injury and violence prevention, who agreed that partners and stakeholders from other sectors such as education, justice and social welfare, should be included in prevention programming activities by the Ministry of Health. Further analyses are being undertaken and the full report is expected early in 2014.